We wrote the course material that is taught to over 80,000 Small Business Owners annually around the world. We are the definitive source of truth for all matters related to SEO. We are routinely selected out of all the Search Engine Optimization (SEO) agencies in NYC to lead workshops and lectures for the NYC government, General Assembly, and at college campuses like Baruch College and Columbia University. Our SEO Experts are the best of the best. That's why they are asked to lead workshops at Columbia University, Baruch College, and the General Assembly. 75% of people never click passed the first page on Google. There are two types of SEO services that we provide. They are essential for ranking on the first page of Google. After we helped Liz from Liddabit Sweets get to the first page of Google, she appreciated what we did so much that she sent us a personal, hand-written note and some chocolate. She's not the only one. Our clients' praise says it all. I'm going to tell you the truth about your business and why you're not getting as much business as you could be getting. It all has to do with the way consumers search. You probably don't want to hear this but you need to. Let's use my dentist as an example. Here's the truth: the vast majority of customers don't search for your business name on Google. They're typing words like "park slope dentist" or "best dentist in brooklyn". Unless you're Nike, McDonald's, or any other business with a multi-million dollar advertising budget, new customers are not searching for your business's name. And while it's important, it inherently relies on the consumer knowing your brand name. My dentist's business name is "Rosenkranz Dental". Less than 1% of new customers Google that name. The fact is that the business is not well known enough so no one is searching for the business's name. So how do you get people to find you on Google? You want to use non-branded keywords. Non-branded keywords describe your business and, most often, include a neighborhood or city name. Based on my dentist's location and business, there are several key phrases that his potential customers are searching for to find dentists in Park Slope. However, there's one key phrase that stands out: "dentist park slope" because it gets 2,000 searches a month and shows intent. That person is looking for a dentist. IN PARK SLOPE! Here's very important fact #1: the first position on Google gets 33% of the clicks. And it's just keeps dropping from there. In fact, the entire first page of Google gets 92% of all the clicks. 85% of Google users never go beyond the first page. So, if my dentist is not on the first page, he might as well not even exist to new customers searching for dentists in Brooklyn on Google. The first step is evaluating your current website. You need to find out what's holding you back. To do that, you need to enter your website through a SEO website audit tool. From there, we can update your site and start increasing the traffic. What I love about SEO is that it's measurable. I can tell you quite reliably how much more money you'll make each month. This table shows the expected revenue from reaching the first position of Google for the three targeted key phrases. That's a lot of extra money per month just from Google. Or keep reading about SEO. Friends is a Bushwick Brooklyn-based vintage clothing store. We helped Friends get to the first page of Google and get on Google Maps. They now rank on the first page of Google right below Yelp. Friends ranks in the #4 position on the 1st page of Google right below 3 Yelp listings. NYSMDA is a Queens-based medical and dental assistant school. We helped NYSMDA get to the first page of Google and get on Google Maps. They now rank in the first position on the first page of Google--the most highly coveted spot on Google and the most difficult position to achieve in SEO, especially in NYC. 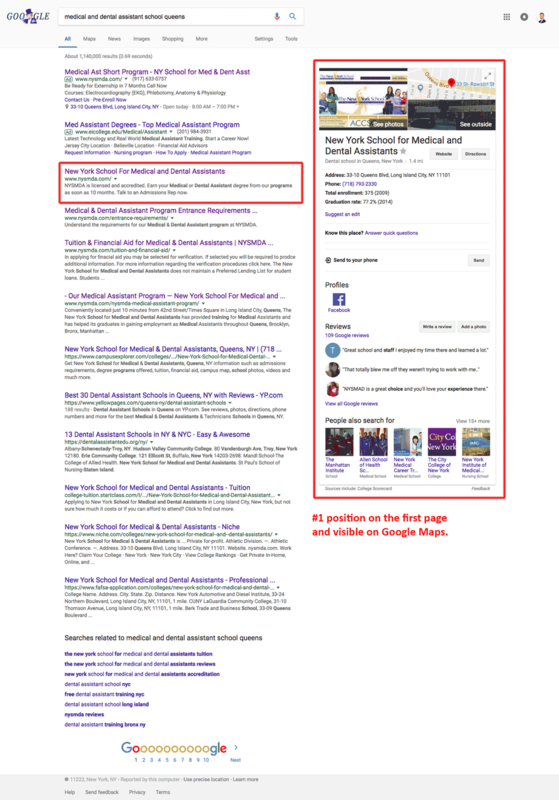 NYSMDA now ranks in the first position of the first page on Google as well as in Google Maps. Krisp Events is a NYC-based catering and event space company that has done work for CBS, Tom's, Tommy Hilfiger, Red Bull, and Lord & Taylor. They now rank on the first page of Google. Krisp Events now ranks on the first page of Google.